Home Hardware Reviews Peripherals Gunnar Optiks : Gimmick or the Real Deal? Gunnar Optiks : Gimmick or the Real Deal? 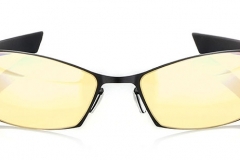 Gunnar Optiks : Gimmick or the Real Deal? 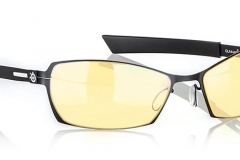 We’ve had a few emails here asking about Gunnar Optiks eyewear, specifically whether they’re a gimmick or legit. As it happened, we were able to get a pair of Gunnar SteelSeries Scope Onyx Carbon Eyewear to try out thanks to the guys at Evatech.com.au in Oakleigh, Victoria. Evatech have an easy-to-navigate online store and a great range so it’s worth wandering over to their site if you’re considering an upgrade or new build. Unless you are in some form of denial, eyestrain is an occupational hazard of being a PC Gamer. Whilst it will impact on people to different extents, long periods of time looking at a light source will affect your eyes. In my case, I get dry, itchy eyes and eventually headaches. I find it harder to game in low light than a well lit room but I enjoy a dim room when gaming because it’s more immersive. I was really keen to take the Gunnar Optiks challenge and try out a pair to see if they really made a difference. As I’m the test subject here, I’d like to take a second to describe my vision and my screen time. I don’t wear prescription lenses but I do have issues when it comes to glare and headaches. Examples are night driving / headlight glare and when it’s sunny, I’m rarely seen without my polarised sunglasses. My vision as tested earlier this year is 20/20. My day to day job has me in front of a computer screen 75% of the time and I probably spend about 90 minutes or more per evening in front of a screen of some kind as well. I don’t game in the dark or low light because I get headaches. So do they work? YES they made a difference to me – without a doubt. In my scenario, I was able to notice an improvement when using the glasses. Gaming in a dark room was a definite improvement in that I didn’t get a headache when wearing the Gunnar lenses but I consistently experienced headaches without them in the dark. In a typical study environment with a central fluorescent light, the difference was less obvious but I felt that my eyes stayed more moist and less fatigued when wearing the lenses. It was harder to discern a significant difference during the day but my daytime workflow involves regular breaks from my screens due to calls, meetings etc. That said, wearing the lenses for a few days at a time, then not wearing them for a few days and switching back again at the end had me of the opinion that I’d rather work with them on. Night-time gaming is a no-brainer. If I game in the dark without the Gunnar lenses, I get dry itchy eyes and headaches within 45 minutes. I noticed that the backlit keyboard started to become a little fuzzy as well. When wearing the Gunnar lenses, I don’t have this problem and easily passed the 2 hour mark without any issues besides the fact that it was getting late. Try as I might, I couldn’t measure my blink rate but I did notice that I rubbed my eyes a lot more when I wasn’t wearing the Gunnars. The weight of the SteelSeries Scope Onyx Carbon pair that I tested was amazing. This eyewear is so light that I could easily forget that I’m wearing it. The arms of the frames don’t put undue pressure on the sides of my head or irritate my ears. In short, they are really comfortable. It took a day or so to really adjust to the yellow tint at first but after that, I’d say that it takes a minute or so once you put the lenses on to adapt to the shift in colour and contrast. The screen image feels sharper but if I was doing work that required colour accuracy, I’d have to consider one of the Gunnar Crystalline series line that don’t have the amber tint. Although it isn’t really noticeable, there seems to be an ever-so-slight magnification in the lenses as well. In my case, I found this to be a positive thing and really appreciated the lens package as a whole. The review sample I tested was only one of the many available styles but the shape of the SteelSeries lenses gave good coverage, and I didn’t find myself noticing the edges of the frames very often. As I don’t wear glasses normally, the awareness of the frames was not unlike (and perhaps less than) the awareness I have when wearing sunglasses. Packaging is solid and I felt that they had ample protection for transit. In terms of build quality, glasses are typically somewhat delicate but I didn’t notice any scratches, frame distortion or general ‘cheapness’ in the SteelSeries pair that I tested. When it came to smudges and cleaning, the Gunnar lenses were no better or worse than the polarised lenses in my Ray-Ban sunglasses. When viewing my screens though the lenses, I didn’t notice any distortion in my vision through any area of either lens. Prescription lenses are also available – check out the Gunnar website for more details. Basic ergonomic common sense needs to prevail here as well folks. It’s clear that gaming products are getting much better in terms of keyboard / mouse ergonomics, headsets are getting lighter and monitor stands have evolved to a point where there is no excuse for poor posture. People still need to remember the most important thing is to take regular breaks – elite athletes take breaks or have rotations during a game. Disclaimer: Vision is highly subjective and your own personal experience may be different to mine. I’m a believer. 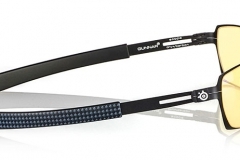 My overall experience with the Gunnar Optics SteelSeries Scope Onyx Carbon eyewear was great and I’ll continue to wear Gunnar eyewear – especially in the evenings. It’s hard to single out one thing that ‘made’ the difference. I was particularly impressed with the improvement in the evenings when my eyes are at their most fatigued. Whilst the tint did change the colours a little, it was a fair trade-off for the comfort and it didn’t take long for my eyes to adjust to the amber tint. I liked the effect that the lenses gave in terms of contrast as well, especially when working with a lot of text. From a value perspective, there are options available at different price points but $70-80 isn’t a bad spend if it means less headaches and a better gaming experience. When you also take into account that the build quality is of a decent standard it’s easy to consider these good value. I’d like to thank Evatech for organising the review sample for us to test. This was one of those reviews that we had on our ‘to do’ list but hadn’t got to just yet.